OTTAWA - Canada's swift response to the tragedy in Haiti hasn't boosted the federal government's popularity among voters, a new poll suggests. Voters apparently remain unhappy about Prime Minister Stephen Harper's unpopular decision to prorogue Parliament and aren't swayed by the popular effort to help Haiti, said pollster Allan Gregg. The latest Canadian Press Harris-Decima survey suggests the Conservatives and Liberals are in a statistical dead heat, with 32 per cent supporting the Tories and 31 per cent for the Liberals. The gap is well within the poll's margin of error. "We're back into too-close-to-call territory," said Gregg. The NDP were at 15 per cent, while the Bloc and the Green party each had 10 per cent. 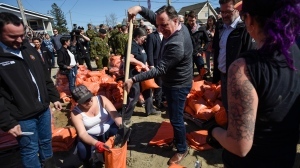 Gregg said prorogation remains a dead weight for the Tories and works against the kind of popularity boost they might have looked for after a speedy and high-profile response to the earthquake. "There continues to be a lingering anxiousness and animosity around the prorogation issue and, as a consequence, what you see is an unwillingness to concede that these guys are actually engaged and involved and working," he said. But this animosity could fade, he added. "There's no question that they're getting really solid grades for Haiti, so I think right now those two things are creating kind of a conflicting impulse, where nothing is changing but the sands have a potential to change." Gregg said the data don't hold much good news for the Liberals and Michael Ignatieff, but reflect the simmering anger over prorogation. "Harper basically put the puck in his own net," he said. "It's not really a function of anything that's significantly positive that the Liberals have done or any growing affection for Michael Ignatieff." He said this is reflected in earlier poll data. "It shows that while Harper took a real kicking on proroguing ... Ignatieff had not gotten any lift whatsoever." Harris-Decima interviewed 1,000 people Jan. 21-24 as part of an omnibus telephone survey. The survey is considered accurate to within plus or minus 3.1 percentage points, 19 times out of 20.